How to complete a noisy perspective rectangle? I have an image of a rectangle that is noisy (perspective image). I know the value of $x$, $y$, and angle $3$. Angles "$2$" and "$4$" are not accurate. Also, I know the real rectangle size. The angle "$1$" is noisy. I want to complete the rectangle and calculate the angle "$4$" in the image. Having this information, can I calculate the angle "$4$" and complete the rectangle? Can I calculate the angel "4" and complete the rectangle? As discussed here, a perspective transformation is uniquely defined by four points and their images. So you can take any rectangle as preimage, guess positions 2, 3, 4 from your image, place point 1 anywhere and still find a projective transformation to achieve this mapping. Knowing 2, 3, 4 and the original rectangle does not add value towards knowing where 1 has to be. Assuming perspective rectangle means a rectangle under an arbitrary projective transformation, which is how I'd read the question. Detect the contour that delimits the rectangle in the image. Since your image has a high contrast, it should be enough to use a marching squares algorithm with a global threshold. Process the contour to split it into 4 contours, one for each edge. You could split, e.g., the contour with the four extreme points (most up-left, most up-right, most down-left, most down-right). For every such contour, estimate the best fitting line, i.e., the line that interpolates the points of the edge contour in a "best" way. For this step you could use a RANSAC algorithm. 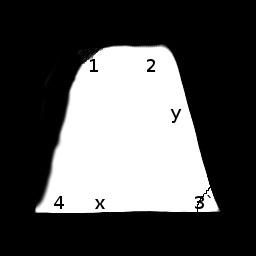 Finally, estimate the angle $4$ by computing the angle between the two lines that interpolate the edges incident in angle $4$. Not the answer you're looking for? Browse other questions tagged geometry projective-geometry image-processing computer-vision or ask your own question. Calculate new positon of rectangle corners based on angle.